The inspiration for the sheet dress started in October 2008 when the stock market plunged and the recession was on it's way. Like most Americans, the first order of business was to cut back on all unnecessary spending. That meant clothes. Especially sense I had no shortage of them. My closet overflowing with things I hadn't worn for one reason or another. I thought, if I could revamp or redesign some of my clothes, I could create a whole new wardrobe without spending any cash. Over the last 20 years I had sewn, Halloween costumes, a few things for my daughters drama class and some toddler clothes. It had been years since the last time I did any sewing for myself. This time I was going to sew anything I wanted. Something to wear and something I loved enough to motivate me through to the end. I knew I wanted a summer dress 1950s style. Something fun, romantic and cool. 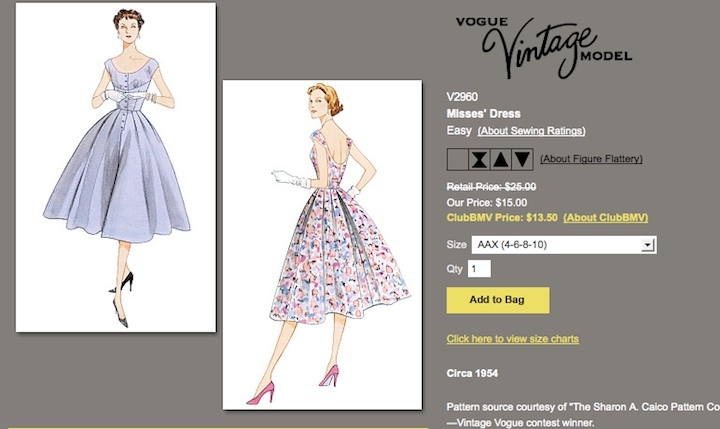 The Vogue pattern above was the 1950s retro inspiration that motivated me forward. In the process of going through my things, I came across my favorite sheets. They were put away because the bottom sheet was worn pretty thin. As you can see from the photo, the print is soft flowers, very old fashioned, and reminded me of sheets you might find in a country inn. I had saved them for at least 8 or 9 years by now. I didn't even own a bed that would fit these queen size sheets anymore. So I'm thinking this would be the fabric for my new dress, which is how it got the name "sheet dress". I new I wanted something cool and casual for the summer, and these soft cotton sheets might be perfect. I also decided to line the sheet dress with a cotton fabric, and since my goal was to spend 0 tp little money making this dress, I had to find something in my closet to line it with. Since I save curtains too, I quickly found some cream colored linen curtains that I could use for the lining. I was quite excited about the possibilities, not to mention the closet space I freed up on all these sheets, curtains and table cloth in this case. As much as I loved the pattern, I didn't feel confident about all the little buttons holding my double D's, so I decided to change the front to just look like buttons, but actually I would use old bra hooks to close the front. Of course you wouldn't see them, they would do the heavy lifting, but they would be on the inside and it would still look like little buttons on the outside. That was the plan anyway.I searched through every pattern on the market at the time, and this is the one I came back to over and over. I just loved it and still do. I had been thinking about getting back into sewing, but hadn't fully committed to a sewing room. I never had the option for a sewing room until my oldest (22) daughters room became available. 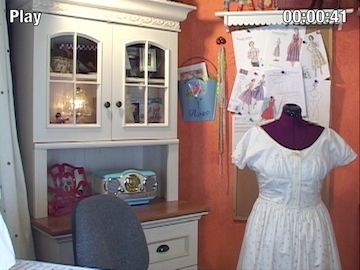 I had been using it for an office, until one day my wonderful husband said, why don't you share my office and turn your office into a sewing room. A light bulb went off! Why didn't I think of that? That gave me a new vision. A year or so earlier I had put together the office furniture by Christopher Lowell. I loved it, and had been using it for office misc, but with this new vision, I was excited about transforming it with beautiful fabrics, trims, buttons, threads, etc. So I prepare the sheets (Wash,Dry,Iron) and lay them out. Measuring, pinning, marking, cutting, clipping, and reading instructions all along the way. This is a pretty advanced pattern, so I paid close attention to every step, and really enjoyed this therapeutic process, taking my time with each step and not working past my patience. 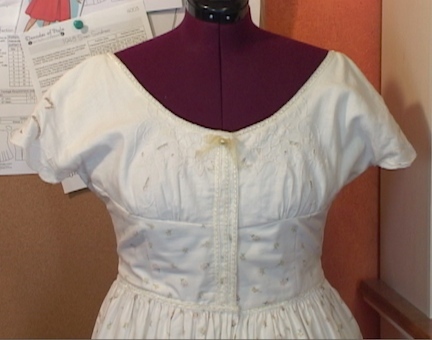 Things were going well so far , but because this dress has a full skirt, there was a lot of fabric to deal with. Important to stay organized and focused. I also had extra challenges working around the imperfections of the old sheets, but because they were old sheets, I was able to go forward without the fear of cutting and messing up new expensive fashion fabric. Once the pieces on the sheet dress were all cut out, I began sewing the top section together first, then the bodice, and then the skirt section. I sewed the lining and attached it to the dress. Things were still going well, and I was having fun and loving the way the dress was coming out. Since I hadn't spent much money on the dress, I was feeling really good about it. Then it happened. All that fabric now sewn together in one piece. The dress is about 5 yards and the lining about 5 yards, so I was trying to wrangle 10 yards of fabric through my little sewing machine. There was occasional tugging and such as a result, but because the sheet I used happened to have the most worn out part of it right in front of the skirt of the dress, it was a disaster when it ripped as I was pulling it through the sewing machine. It was right in front, and the rip was not straight, or in a place that it could be hidden easily. I had a girl party in a few days with the Joyful Red Hatters. I had planned to wear the dress to that, so when the rip happened it really threw the schedule off on time. Christopher Lowell used to say in his decorating shows, " add whenever possible, instead of ripping out". That applied to decorating, not sewing, but I decided to try that philosophy here. My only options were to either start seem ripping a lot, or figure out a way to cover it. After all I did have another sheet . Since I wasn't sure the used sheets could even take the seam ripping, and did I mention there would have been a huge amount of seem ripping, since the whole thing was already put together with the lining, I went with covering it up. I found some nice parts of the remaining sheets to fix the problem with my sheet dress. Cut out a new skirt front (2 huge pieces), sewed them right over (like an apron) at the seem between the bodice and the skirt (photo below). Then added trim to smooth it all out. 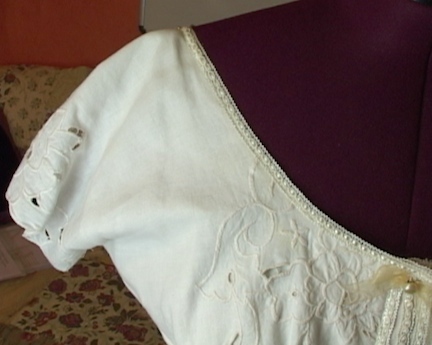 I also had challenges with the bodice fitting just right. I added more trim around the neck line and anywhere else I needed to cover up some imperfections. Instead of buttons I used the trim there too. What I didn't like about the sheet dress: Adding that last peace really hid the best part of the dress. 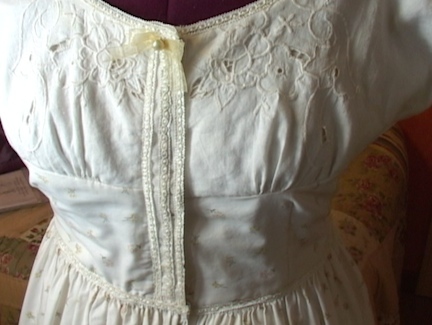 The darts and bodice detail that flatters the waist line was lost behind the new added skirt front , making the waist look a bit larger, then there was the added trim to that. That I didn't like at all. What women tries to make the waist bigger?What I Did Like about the Sheet Dress: I love the fabric print and soft comfort. it's like being wrapped in your favorite sheets. I liked the fit. It was a bit snug across the breast due to all the adjustments at the end, but it worked. The wide scooped neck shoulder doesn't offer a lot of support, so I found myself tightening the upper part of the dress to hold it in place. Have I worn the Dress? I did wear the sheet dress to my girl party, and I wore it to my parents ranch for Easter. It was so comfortable and looked perfect for Easter. I was more comfortable than if I had been wearing jeans or many other types of clothing. It was a real conversation piece. It was a bit heavy, but I felt secure in it and because it's not form fitting like pants or shorts , I was super comfortable. I will be wearing this dress for a long time. What I learned and how much it cost? The cost for the sheet dress was about $15 in trim. If I had purchased $75 in fabric, I would have been a lot more stressed about attempting such an ambitious project, and maybe not as happy about the end result. I had the guts to attempt this dress, because I was using material I owned for years. It got me back into sewing again, and I enjoyed it, but ultimately I learned I wanted to make the dress again. This time it would be perfect, but not sure yet if it would be another sheet dress.